Kruse Rhododendron State Reserve is located adjacent to Salt Point State Park. Edward P. Kruse donated the land to the people of California in 1933 as a living memorial to his father, a founder of San Francisco's German Bank. The land was part of a large ranch established in 1880, on which the Kruse family raised sheep and carried on logging and tanbark harvesting operations. Today, this pristine reserve contains 317 acres of second-growth redwood, Douglas fir, grand firs, tanoaks, and a plethora of rhododendrons. Each May these spectacular flowers burst into bloom and color the deep green of the forest with brilliant pink blossoms. There are five miles of hiking trails through the quiet forest with a short loop trail that leads through clusters of rhododendrons. Ferns carpet the canyons where seasonal streams abound. 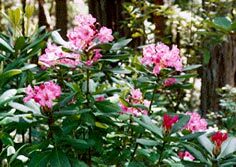 In addition to the rhododendrons, other understory plants include salals, pacific wax myrtle, and California Huckleberry. Please remain on the trails so that the young plants may flourish. No dogs or bikes are allowed on the trails. Buses are not recommended as the narrow road has no turn around. The wealth of rhododendrons in this reserve is a direct result of normal plant succession patterns following a severe fire that once occurred here. Today, the regenerating forest is gradually overwhelming the rhododendrons. As forests constantly evolve, plants compete for available sunlight, water and nutrients and the best suited species dominate the environment until they create conditions more conducive to the success of other plant populations. In order to maintain fine displays of rhododendron blooms, the current plant succession must be slowed, which is the goal the Department of Parks and Recreation in its management of the reserve. To achieve this goal, the tanoak trees have been thinned out and the rhododendrons revived with the renewal pruning practices. This has ensured vigorous new growth and a diversity of blooming heights. When the rejuvenation project began during the fall of 1979, there were few blooms, and those that did appear were all well above eye level. Tanoaks were crowding out the rhododendrons by successfully competing for available sunlight, resulting in rangy growth habits of the rhododendrons. Final major pruning occurred in the fall of 1981. By 1984 a significant increase in the floral displays was evident.